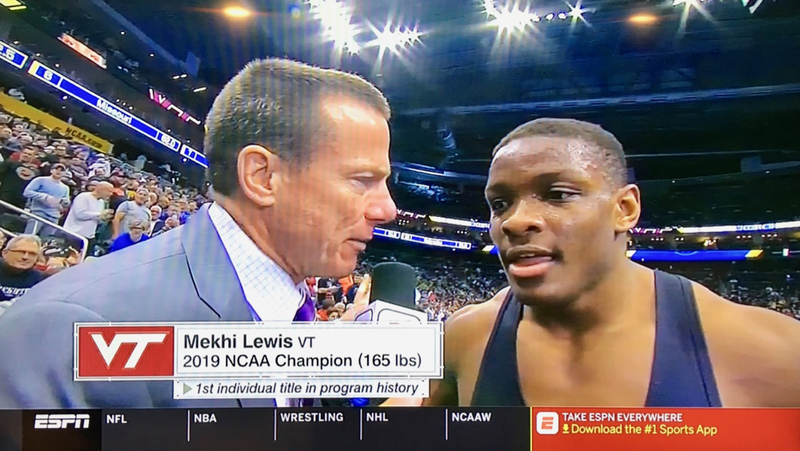 Last night Virginia Tech got its first ever individual title when Mekhi Lewis, a red-shirt freshman, became the NCAA Champion at 165 pounds. Bill and I watched Mekhi wrestle when we were in Blacksburg in February. He is such a strong and dominate athlete and look forward to watching him wrestle for VT for the next three years. Congrats, Mekhi! Virginia Tech finished eleventh overall in the team race, my friend John‘s Nittany Lions won the National Title again for the fourth consecutive year (eight National Titles in the last nine years), and Kim‘s Iowa Hawkeyes finished in fourth place. I graduated from physical therapy on Tuesday with instructions to call back and make an appointment if things took a southward turn as I picked up my running mileage. As much as I love my therapist (I’ve known him for about fifteen years ), I was thrilled to put those appointments behind me and not have one more thing to schedule around my already overflowing calendar. My weekly mileage total hit 10.54 miles, the most since late November. I feel really good while running, and more importantly, I feel fine after I finish and into the next day. My speed is slowly coming along (10:15-10:30 paces), but I’m trying not to focus on it at this point and just run on how I feel. 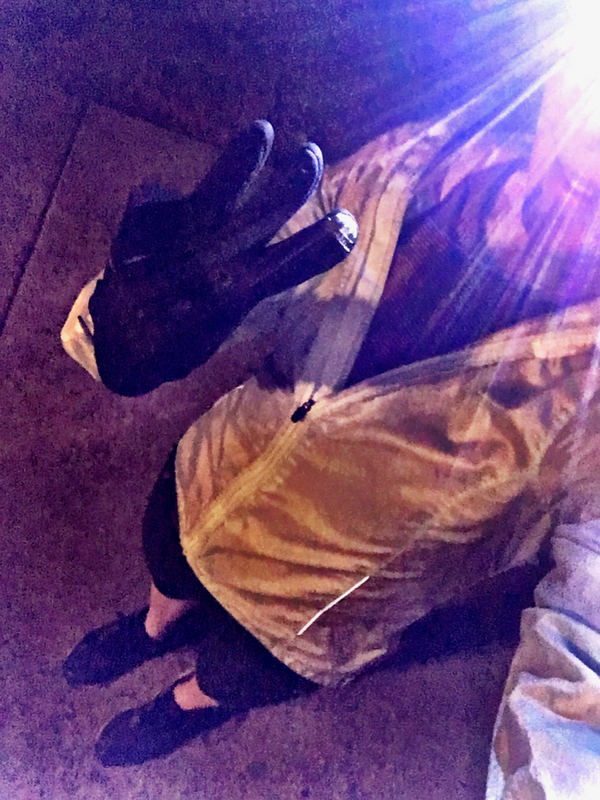 I started my two weekday runs at 4:50 AM – yes, you read that correctly. With clients starting at 6 AM several mornings, I had to fit my runs in when I could, and this past week later in the day wasn’t an option. After a Friday afternoon nap to try to catch up on my sleep, I still slept in until 8:15 on Saturday morning. Luck was with me and I ran into my Cruiser friend Shawn shortly after I left my house so I had company for about three of my four miles. 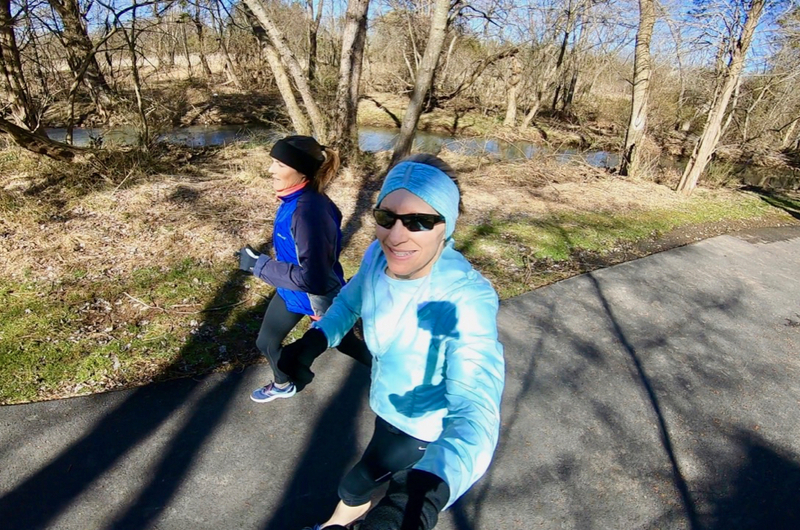 It was blustery and cold, but it felt so good to be running in the sun! I rode 55 miles this week, all on my spin bike (affiliate link) indoors. I’m hoping to soon hit the W&OD Trail on Zephyr, my practically-new Salsa; however, the temps will have to warm up into the low 60’s before my fingers will be able to withstand the cold air blowing across them, even in gloves. Now that I’m finally starting to feel back to normal, I hope to add in some new-to-me yoga routines from Five Parks Yoga. Of course, cobra pose will continue to be a daily staple since it’s so good for my back. Do you have spring-like weather in your neck of the woods? ~ It’s been slow to warm up here, but this coming week seems a little more promising. Glad you’re feeling better! As for sports, I’m a huge NCAA basketball fan, and (currently) my two teams are still in it (Iowa and Michigan State)…..that may change this afternoon (?). Thanks much for joining is for the WRD! My team is still in it, too, but we play Duke on Friday night. We beat them during our regular season a few weeks ago, but that was with both their star player and our star player out due to injuries. I think their star (Zion) is the top player in the nation, though. 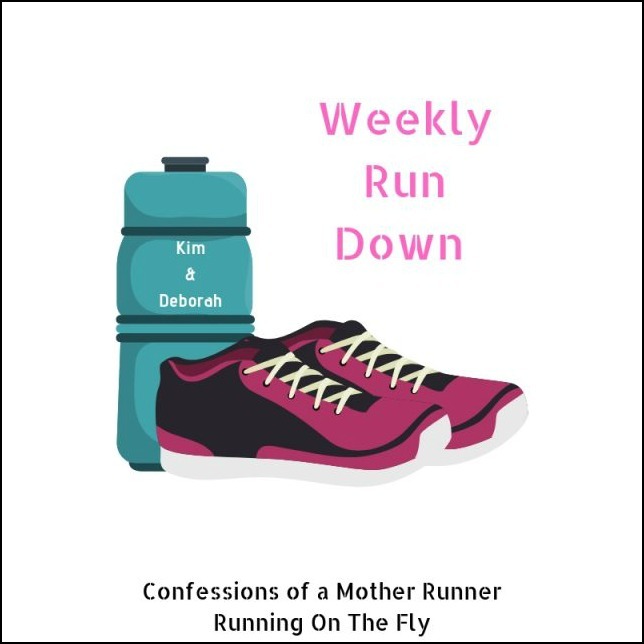 Unfortunately, there were a few days where I either had to get up at that hour or skip my run entirely, and with trying to be consistent with my gradual buildup in my running, I really had no choice. Fortunately for me, I really don’t mind getting up that early. hooray for making miles again!! this is awesome news! but I hear you on the more frequent doctor’s visits – I felt like that the last two years just trying to sort out my foot. The only sports I really follow is running sports 🙂 Ron is really into skating. But you know the Dutch are excellent at skating! Your description of spring weather in the Netherlands seems similar to what we had on Friday if you throw in some hail, also. It was crazy! So glad to read about your running progress. 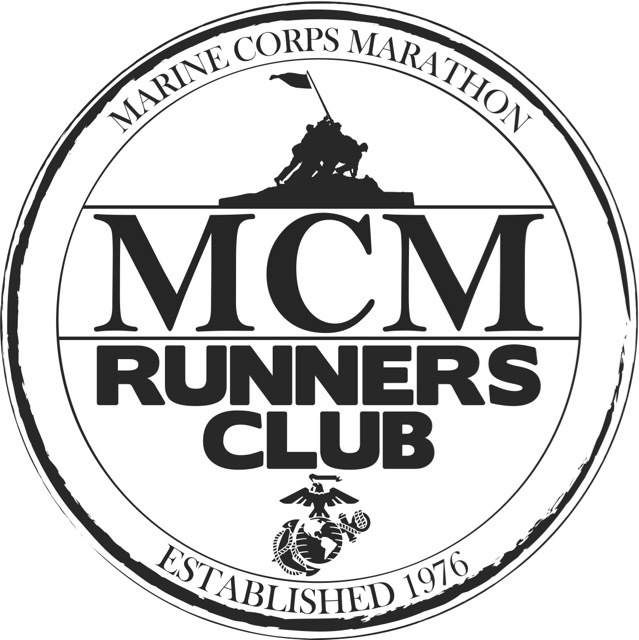 I did my first race since recovering from my injury – the Marine Corps 17.75k on Saturday and felt great. We are both on our way back! Happy PT graduation! Several of my friends ran the Marine Corps 17.75K as well. I’m glad you had a good run! High 5 to my fellow early bird runner! It does seem crazy but when it’s the only time to get it in for the day, you make it work. Glad things are feeling great! Thanks, Angela! And yep, we’ve gotta do whatever’s necessary to make it work. Glad to see you moving forward with your running! Now if it would just warm up enough to take the bike out, right? I know, right? We’ll have to see what this weekend brings. Thanks, Cari! Hopefully, the MRI will point us in the right direction. In the meantime, I’m loving feeling almost 100% “most” of the time. Running pain free is always a blessing. I hope you can get to the bottom of the toe numbness! Thanks, Judy! That sounds like our March this year, too. Great job this week! It’s hard coming back, but you’re doing awesome. The weather has been gorgeous here – I guess we can call it spring, but Florida really only gets 3.5 seasons of Summer and .5 of Winter so who knows? No races this past weekend, but there is one on the calendar for Sunday. I’m not into NCAA basketball or any kind of wrestling, but Jacksonville hosted Round 1 and 2 of this weekend’s tournament. My brother in law and nephews came down for it and all the boys, little man included, attended Thursday and little man would have gone Saturday too if he didn’t have his own game to play. They loved it. I bet they had fun at the NCAA basketball tournament! No spring here yet . . . we had a big dump of snow last week. Congrats on your highest mileage week in awhile. Good job on the spinning mileage! I can’t wait to get my bike outdoors! 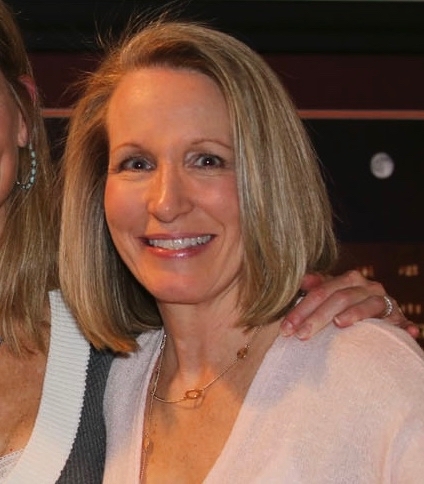 Allie recently posted…The Rundown – So It’s My Birthday and What Have I Done? I can’t wait until it’s warm enough and I’m able to ride outside again with my husband and friends. Of course, then I’ll be complaining about how hot and humid it is! I had a race this weekend. Great weather and fun race! Cool! 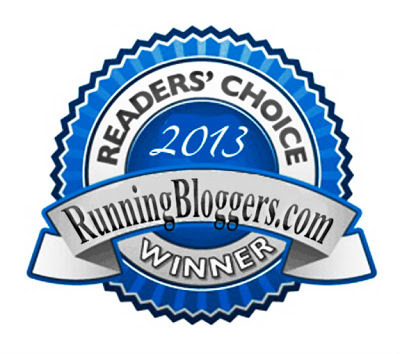 Was it the Shamrock Shuffle?